Former Dallas Cowboys NFL football player Josh Brent, right, stands with Dallas Cowboys linebacker Sean Lee in court after closing arguments in his intoxication manslaughter trial. DALLAS — It was the middle of July in 1996, and Troy Aikman was in possession of football’s most demanding schedule — overflowing with the rights and responsibilities that come with existing as a freshly-minted three-time Super Bowl-winning quarterback of the Dallas Cowboys. There was mostly the business of leading a football team. But Aikman couldn’t leave one member of that team behind. Aikman and Irvin had forged an unusually close alliance as their Cowboys built from a 1-15 season to those Super Bowls. 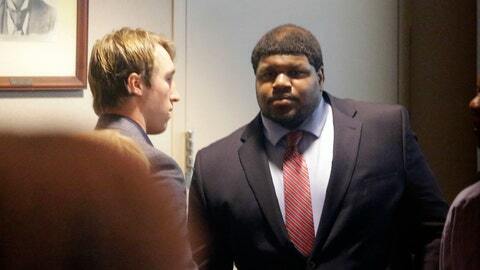 I have no indication that Josh Brent and Sean Lee share a similar bond. Yet there was Lee, attending Tuesday’s closing arguments in a Dallas courtroom sitting shoulder-to-shoulder with Brent, who now awaits jury deliberation after being charged with intoxication manslaughter in the December 2012 death of his friend, Cowboys practice-squadder Jerry Brown. Lee left the courtroom without speaking to reporters, but might’ve very well been motivated as Aikman was before him. Aikman and Irvin aren’t the same as Lee and Brent. The first pairing achieved superstardom; Lee is gifted but oft-injured, and Brent is a former seventh-round pick who was a part-time starter. Aikman may have risked some public scorn for his support of his teammate, though the quarterback’s glorious achievements and pristine reputation may have caused him to be bulletproof to any criticism. Lee? He isn’t bulletproof. But his unselfish actions here (mirrored by Tuesday’s courtroom presence of ex-Cowboys standout Nate Newton) demonstrate that Lee thinks there are bigger issues here than criticism that might come his way. This isn’t a football story, of course; these men play that game and that’s their job and because one life has already been lost here and another rather hangs in the balance – Brent could get a sentence as lengthy as 20 years — this courtroom drama goes beyond football and the Cowboys. But it takes a desire for bonding and a skill in leadership to do what Aikman once did. And it takes a desire for bonding and a skill in leadership to do what Lee isn’t doing now.